Chinese Porcelain and by extension the terms Chinese Export Porcelain and Chinese Earthenware refer to the numerous examples of Porcelain imported from China to the West around 18thC to Present. All of these imports were originally shipped by European explorers and trading companies, most notably East India Trading Co., a British concern that monetized early trade routes from Asia and profited greatly from the variety of items found there. Many other companies from several countries of Europe and the United States soon established their own commercial activities in that part of the world. As a result, Chinese Porcelain became widely marketed and spread quickly, first with the affluent social classes and then to most other people that could afford them. In the beginning, the vast majority of these items were of utilitarian nature such as teapots, jars and dinnerware or tableware, many of which in the style of the now famous Blue Willow. As the popularity of Chinoiserie style porcelain surpassed all expectations in terms of demand, more and more decorative items were added, such as vases, chargers, urns, figurines, etc. 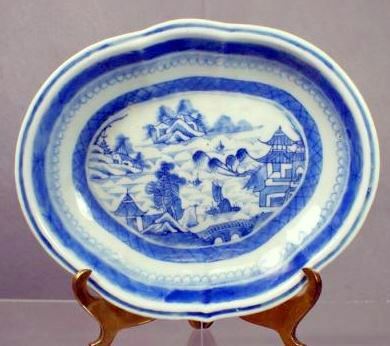 A large portion of these original imports of porcelain from China are also referred to as Canton Porcelain, indicating their origin as from the provinces on Canton. In actuality, most such specimens and other pottery were manufactured in the Ching-Te Chen Province and were decorated or glazed by local artisans around the port of Canton, one of the few areas that European cargo ships were allowed to dock by special permission of the Chinese authorities. The term Ballast Ware is yet another term used to describe these items and refers to their mode of transport by sea. Many shipwrecks along the sea trade routes that have often been discovered or explored by marine archeologists contain remnants of Chinese porcelain on their way to Western markets – here is an article on one such very valuable find of shipwrecked Chinese Porcelain off the coast of Indonesia. Markings on Chinese Porcelain are usually in the form of a four or six Kanji characters Seal marks denoting a specific Chinese Emperor and Dynasty. Several emperors during each dynasty that ruled China over the years mentored porcelain production and encouraged artistic expression on all sorts of crafted items. There are no makers’ marks as such and as we know them in the West that were used in China. Each mark indicates either the period or the style of each item. Most prolific periods of Chinese porcelain production are those of Ming and Qing dynasties. Each emperor during each dynasty is represented using a different symbol and these are tabulated in our Ceramics marks guides. A word of caution: many of these marks have now been re-issued or copied on newer imports from Asia, but by comparing some subtle differences against backstamps observed on items found in the antique market today can help in authenticating true original specimens against recent reproductions, but also in determining the style of these items for a more accurate description if selling online. Our Antiques Pricing Guides contain numerous records of antique and recent Chinese Porcelain sold through various auctions around the world, which can help in evaluating your collection and determining current market trends. Some examples are shown below. Pair of Chinese Porcelain Figural Duck covered boxes. Chinese Porcelain Fishbowl Jardiniere, Satsuma style.